.A journey of my Life. Believe the God's creation is beautiful. Believe there is always a way when u get lost. Believe what i believe. 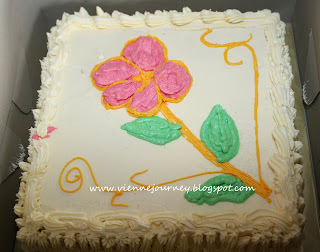 remember i post about went to decorating cake class conducted by Min? well, she was a degree holder and quitting her job to do what she was into..
How i wish i can concentrate into baking..
but i have aim in my life too..
Thanx God that i get more and more order ..
and how i wish i can take order from everyone..
well, i am not the full time baker, i still have my own career and i dunt have maid to help(especially the cleaning part)..
so here is the cake..
it is butter cake with icing buttercream frosting..
♥ like a little LOVE itself.